Did you realize that there are over 600 breeds of pigeons in the world? And most of us probably immediately think only of the seemingly less-than-hygienic gray ones that desecrate city buildings and statues of revered civic patrons and drive pedestrians and cyclists off the beaten path. Like me, you may find it amazing that whenever you open the door to a world of whatever it is that you casually check out, you suddenly realize that you had absolutely no idea just how big that world is. Who doesn’t enjoy a good apple, the daily remedy to keep the doctor away? We may think, Red Delicious or Granny Smith? Tough choice? Try choosing from among the actual 7,500 varieties of apples that exist. If only there were 7,500 kinds of ice cream to put with all those pies. But come to think of it, since I haven’t checked that one out, maybe there actually are. Like the Cone Heads laughing at “astronauts to the moon,” the old Baskin-Robbins 38 Flavors would be mere child’s play. But back to the world of pigeons. Of all the breeds of pigeons, do you know the one that you won’t find listed? The honing pigeon. That’s right, no honing pigeon. If there were such a bird and you checked out Google images, you would find the little guy working away at sharpening blades on say a lawn mower or maybe a nice set of kitchen knives. While the Birdman of Alcatraz trained his birds to do some pretty cool things, none of them had a clue about how to sharpen blades. Hence the term birdbrain, I guess. Ah, but there are indeed homing pigeons, the winged messengers who deliver written messages wherever needed…or wherever the cell reception is really sketchy. Yes, homing pigeons are trained to home in on their target to make their delivery. In one of many unfortunate mangles of the English language, unsuspecting broadcasters and journalists (although, since it is their job, they should be very suspecting) nearly always say that they want to hone in on a topic, when they really have no intention of doing any sharpening. What they really want to sharpen is their word choice. 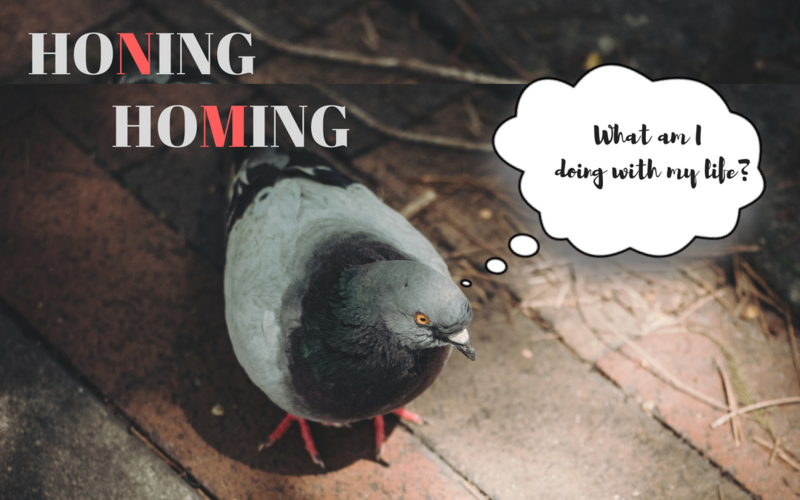 Rather, like our pre-texting and pre-emailing feathered delivery friends, what they actually intend to do is home in on a topic and, like the homing pigeon, truly deliver the correct message. For a fun, but completely non-grammar-related page, click here to see all the different kinds of pigeons you never knew existed. This article was written by Chuck Cady, Owner and President of Cady Reporting Services, Inc. As a well-seasoned Cleveland Court Reporter, he believes in using the best grammar and word choice. He has won the Ohio Speed Cup for speed and accuracy 3 times and retired it. You can find him in our offices at Cady Reporting at 1468 W. 9th St., Suite 440 any day of the week he isn’t spending with his adorable granddaughter, Isla.